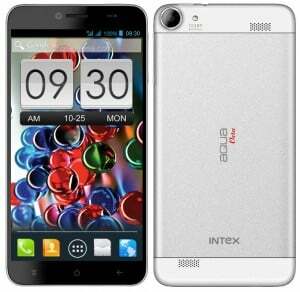 Intex has recently introduced its octa core smartphone in the Indian market. The handset has been named Intex Aqua Octa and has been launched at a price of Rs. 19,999. 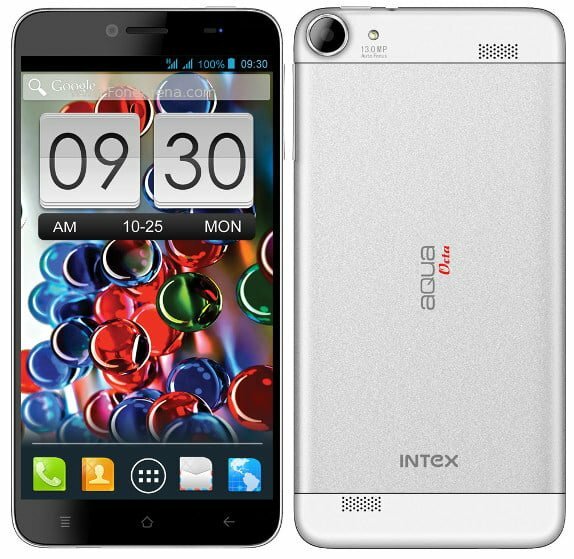 Built: The dimensions of the Intex Aqua Octa handset are 161.06 × 80.86 x 7 mm and it weight approximately 180 grams. The phone feels pretty solid to hold and appears to be of a nicce build quality. Display: This smartphone carries an IPS HD OGS touch display of 6 inches which provides a resolution of 1280 x 720 pixels. In this time when local manufacturers are moving towards 1080p screens, a 6 inch 720p screen might just look like a bit of an overstretch. Processor: Intex Aqua Octa has been powered by MediaTek MT6592 octa core processor clocked at 1.7 Giga Hertz that will ensure hassle free, smooth and faster performance. It also has been equipped with a 700 MHz Mali 450-MP4 GPU. This is the department you need not worry about. Software: This handset works on Android 4.2 Jelly Bean OS. Intex might bring the 4.3 Jelly bean update in future but we’d be surprised if we get to taste the 4.4 Kitkat on it. Camera: This smartphone carries an auto focus rear camera of 13 mega pixels with 1080p full HD video recording and LED flash features. Intex Aqua Octa also features a 5 mega pixel front facing shooter. It looks good on paper but the real world performance is just average and nothing extra ordinary. Memory: This device comes with a RAM of 2 GB and features inbuilt storage space of 16 GB which can be expanded by another 32GB via a microSD card. You can multitask with ease and have plenty of space to store everything you want. Connectivity Features: The connectivity features incorporated in the Intex Aqua Octa are A-GPS, Bluetooth, Wi-Fi and 3G HSPA+. NFC would have been a welcome addition but its not like that everybody has NFC so we are pretty sure it won’t be missed much. Other Features: This smartphone comes with dual Yamaha 1420 speakers. It is dual SIM handset that supports GSM and WCDMA SIMs. It also offers FM Radio and a 3.5 mm audio jack. This handset will be available in white and black color variants. Battery: The Intex Aqua Octa runs on a battery of 2300 mAh capacity that can provide a standby time of about 180 hours and talk time of nearly 6 hours. We would have loved a bigger battery because with such a big screen and all those heavy applications available for running, you might just run out of juice a bit earlier than you’d expect to. Our Take: The Intex Aqua Octa is quite an amazing product at this price. Pre loaded with a wide range of useful applications, such as Matrabhasha multilingual app, NQ Mobile Security, Intex Game Club, Opera Mini, BigFlix, OLX and so on, this handset serves the purpose of functionality as well as entertainment.